supplied with water from Lake Gordon, above. TWO Derwent Valley power stations are in line for multi-million-dollar upgrades to serve as part of the proposed "battery of the nation" as Hydro Tasmania investigates the prospect of using "pumped hydro" to double the state's energy output and support the national grid. A shortlist of about 30 potential pumped hydro energy storage sites has been identified and funding from the Australian Renewable Energy Agency (ARENA) will help narrow that list to between 10 and 15 possible development sites. When fully realised, pumped hydro could generate up to 2500 megawatts of electricity, which would double Tasmania’s current hydro capacity. It has been said this could also create up to $5 billion of infrastructure investment and 3000 jobs over a 10-15 year construction period. Hydro Tasmania chief executive Steve Davy said Tasmania was uniquely placed to help lead Australia through its energy challenges. “The Battery of the Nation is about energy security and affordable prices,” Mr Davy said. “Doubling Tasmania’s renewable energy capacity addresses three big challenges at once. It will lock in full energy security for Tasmania, help give Tasmanians some of the nation’s cheapest power prices, and give us plenty of spare energy to support mainland Australia." ARENA has recently committed up to $2.5 million for Battery of the Nation project studies, with funding to be matched by Hydro Tasmania. The ARENA funding includes $300,000 for the initial study to assess and prioritise potential pumped hydro sites, and $500,000 to support feasibility studies into the Tarraleah and Gordon Power Station projects - which will boost efficiency and reliability. 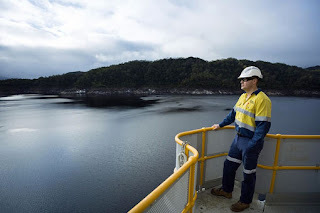 Mr Davey said Hydro Tasmania had ruled out developing any pumped hydro sites in the Tasmanian Wilderness World Heritage Area, and was not investigating new on-river dams. Pumped hydro storage works by pumping water uphill (when surplus energy is available) so it can be re-used to generate electricity later. With the support of ARENA, Hydro Tasmania is conducting pre-feasibility studies into the redevelopment of the Tarraleah Power Scheme and the augmentation of the Gordon Power Station at Strathgordon. The Derwent Valley's Tarraleah Power Station is more than 80 years old. Its redevelopment would involve building a new power station, which would cost up to $650 million and increase the energy output by up to 200 gigawatt hours a year. Meanwhile the augmentation of the Gordon Power Station would involve building a new turbine at Tasmania’s largest power station. To manage environmental water flows, one of the largest turbines is currently being run at very low efficiency. The proposed improvements would allow more efficient generation from existing environmental water flows to the Gordon River. The initial stages of the Tarraleah and Strathgordon studies, jointly funded by ARENA and Hydro Tasmania at a cost of $1 million, are due to be completed by the end of the year. Based on the outcomes of the studies, construction on augmentation of the Gordon Power Station could start next year. Energy Minister Guy Barnett recently spoke about Hydro Tasmania's $275 million upgrade program the entire Derwent system, including a $28.5 million investment in the Cluny Power Station. energy output from the Station and reduce environmental risks. Following the completion of work on the Cluny Power Station, Hydro Tasmania will then begin upgrades to the Repulse Power Station," Mr Barnett said.